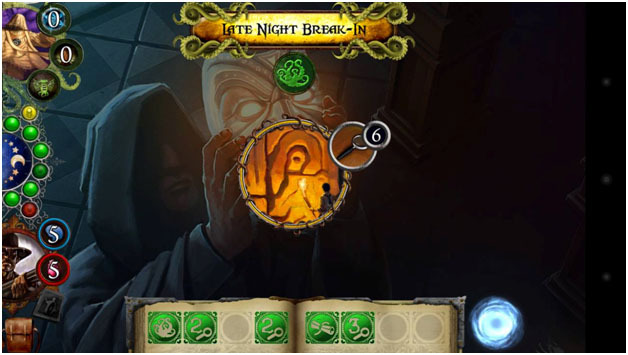 I have a love for cellphone games, board games, and Lovecraft lore, so lucky for me all these things come together in Elder Sign: Omens, an adaptation of the Elder Sign dice game (also a great game) with the feel of a true board game–it’s just much harder to lose the pieces. To begin each game, you must choose which Lovecraftian boss to go up against, from Azathoth to Yog-Sothoth. Each boss has its own nefarious game mechanic and doom tracker (once that doom tracker is fulfilled, the game is over and the entire world is destroyed through some unspeakable horror). Your job is to play against the game and collect enough elder signs to seal away the Terror before it can be unleased. 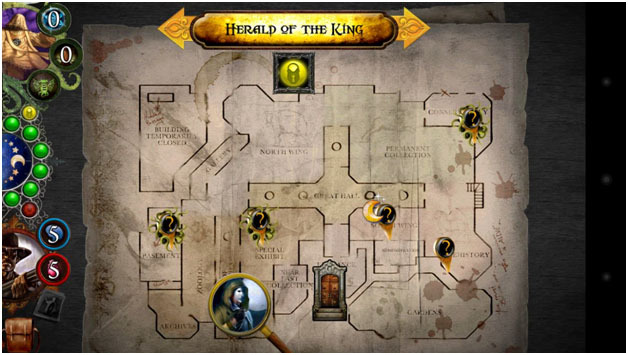 You do this by clearing the different locations on the map where quests and/or small-time Lovecraftian monsters appear. Sometimes otherworld adventures spring up where places like R’yleh open portals on the map. The only way to seal off these openings is to finish the accompanying quest. By completing these mini-quests, characters are able to collect items, money, and occasionally the extremely useful elder signs. Each character has 6 dice, though this number can be bumped to 8 depending on the character’s items. 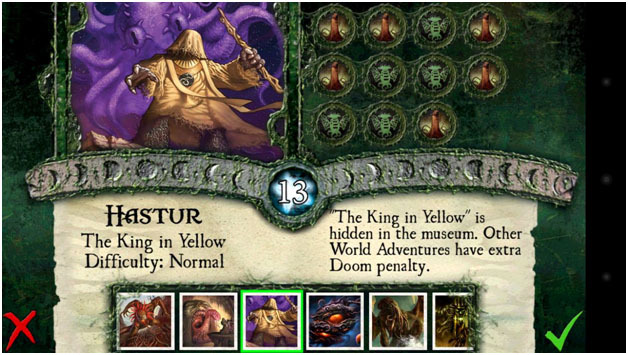 Each monster and quest has a number of symbols attached to it, and you have to match these symbols to the required dice roll to vanquish monsters and complete quests. Sometimes, to successfully defeat a monster, and always when you fail a quest, a character must take a hit to their sanity and/or health. If either of these stats go to zero, the character either dies or is driven mad (and is therefore out of the game). You can play the game with 1-4 characters, so it’s easy to play solo or with friends. Personally, I would recommend playing as 4 characters even if you are playing alone–I find that’s how the game plays best. The triumph of a successful role. How difficult the game is depends on the difficulty level of the boss in question, and some are seemingly impossible to beat (I’m looking at you, Ithaqua). The fun of the game comes from how invested in the quests you become; there is nothing that can quite describe the triumph of a perfect roll that allows you to beat a particularly tough quest, or the despair when you can’t roll that one symbol you need. If you are a fan of Lovecraft or a fan of board games, this cellphone game really can’t be passed up. With the expansions and number of characters you can choose from, the replay value is high, and I can’t think of a more enjoyable way to pass time when waiting in a particularly long line. The game retails for $4.42 on the Google Play store and has three expansion packs: The Call of Cthulhu, The Dark Pharaoh, and The Trail of Ithaqua. Each expansion comes with new playable characters, new monsters, and a new game mechanic. Five elder signs out of five.